We all know the problems that can arise from a deficiency of water. Tens of thousands of garden plants die every year from a lack of it. However, though having too little water can be destructive, having too much can be just as detrimental. 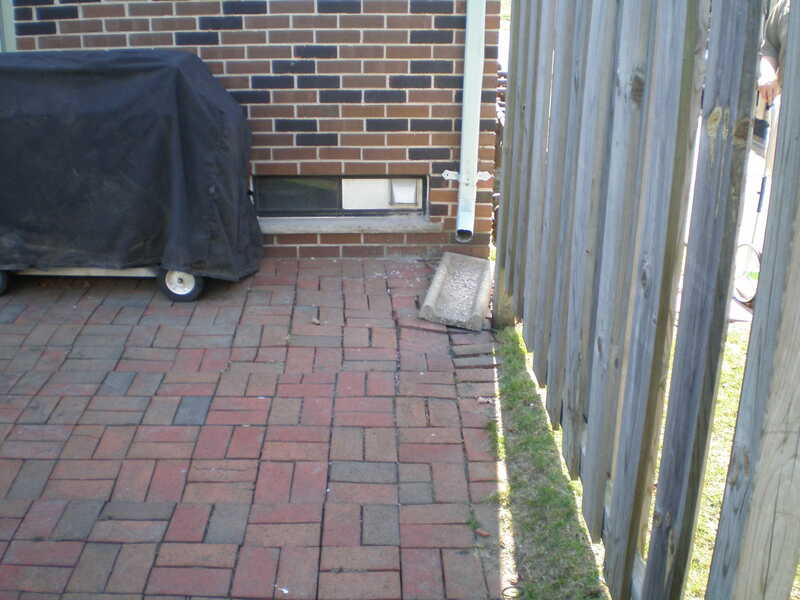 Ideally your yard will have a certain slope to it, and hopefully, that slope does not lead directly to your home or your gutter system does not lead directly onto your patio pavers (see photo). If your yard, or at least a good portion of it, slopes away from your house then you likely won’t have a problem at all. Rain won’t gather, it won’t seep into your basement and all will be well. However, if your yard does not slope, or it slopes toward your home, a heavy rain could mark the beginning of some serious problems. If your gutters and drains don’t utilize a daylight system, problems can also occur. Pools of Water in Your Yard: Not watering your plants enough can dry them out, even causing them to die, but watering them too much can suffocate them. This has the potential to kill them as well. Pools of water left for too long can leave you with dead patches of grass. At the very least the water will likely leave the patch of yard it affected muddy and slippery, a potential hazard for anyone passing by. This will also make the ground weaker and change its properties, meaning that you might not be able to use those areas for the same things you otherwise would have, limiting their potential. Also, if you have walkways, porches, patios or other hardscapes in your yard you might find that water is collecting on those. 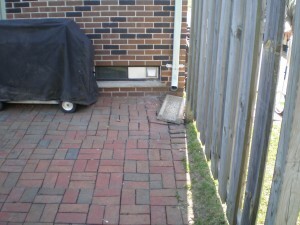 This can also prove to be very dangerous, as well as damaging to the hardscapes. Water Inside Your Home? If there’s a lot of water pooling in your yard there’s a good chance that, at some point, it’ll enter your home. Most likely it’ll do so through the basement. If left unattended, excessive moisture in this area can lead to the growth of mold, bacteria, and fungus. Often these elements will just impart a disagreeable look and an odd smell, but occasionally they will prove to be dangerous. That’s not to mention that many of us store things in our basements, things which we might not want to get wet. If you’d like to avoid water damage you’ll need to de-moisturize the area quickly. A Constantly Running Sump Pump: If there’s water entering your basement a good way to remove it is to install a sump pump. This is a device placed beneath your basement floor which will occasionally turn on and pump any excess water out of your basement. Ideally, they’re only supposed to activate after flooding has occurred, but if your sump pump is running constantly or extremely often you might have another issue entirely. Constantly running sump pumps will have much shorter lifespans than those working properly. They’ll also use up a lot of electricity and generate a lot of noise pollution. If your pump is running too often it might be an issue with the pump or water might be entering your basement at a steady rate. If any of these problems are affecting you, call Twin Oaks. Our civil and structural engineer can come up with a custom draining solution to address your particular problem, taking into account the realities of your unique application. 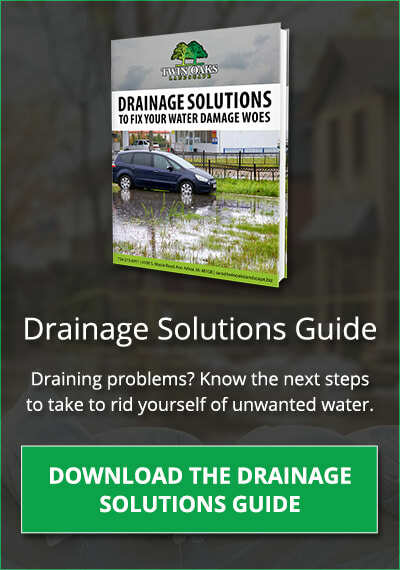 Every one of our drainage solutions is completely unique because every situation is different. Once a plan has been decided upon, our highly experienced and thoroughly trained technicians will come and install your solution under the supervision of our project manager, and before you know it these problems will be a thing of the past. Contact us to see why the Green Industry recognized us as an expert in our field, or why Landscape Management published an article about our innovative Storm Water Management Program. If you need help today, we’re ready to face your issue head on, and we’ll have a custom solution ready soon.